Truck Accessories Insider .com "Knowledge is Power"
Billet Fuel Door ... click here for more pictures, applications and pricing! Are you looking for a billet fuel door cover? The Westin fuel door is my choice for Chevy Ford Dodge and GMC. Ready to give your truck or SUV that customized look? You may already have that going with a chrome or stainless grill guard and a billet grill. 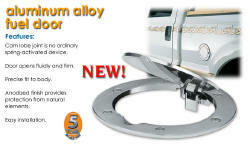 You probably have some chrome 20's already and are ready to finish the look with a universal aluminum fuel door. The in truck bed fuel fill door is a very quick way to establish just who has the best looking ride. And what about protection? How many times over the next few years are you going to chip the paint with the gas nozzel. Not gonna happen with a billet fuel door. Feel the ‘flip’ of the fuel door and you’ll know this is no ordinary spring-actuated device. A cam lobe turns as you open the door, and it’s firm, fluid motion is one of those subtle refinements that is the hallmark of Westin products. Solid, machined, billet aluminum with simulated rivets. Easy no drill installation makes this a “must-have” add-on. A The unique patented cam action device allows for a precise, compact fit to the truck body. B Sturdy billet aluminum construction and a brushed aluminum anodized finish provides protection from the elements.